If you have the plus or pro plan you can install the scroll activated addon. With this addon you can have messages appear when a user scrolls a set distance or to a specific element on a page. With distance you can select what percentage of a page a user must scroll down until the message is triggered. With element you can select the precise moment the message will be shown in relation to the on page element. 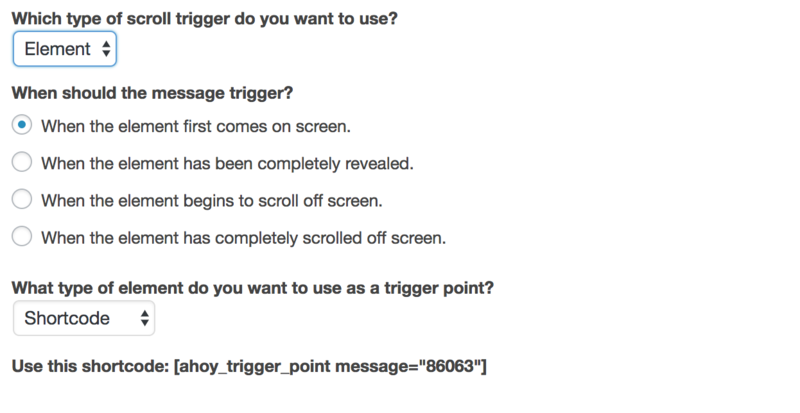 You can also decide whether to use an Ahoy trigger shortcode on the page or use a CSS selector as the trigger element.